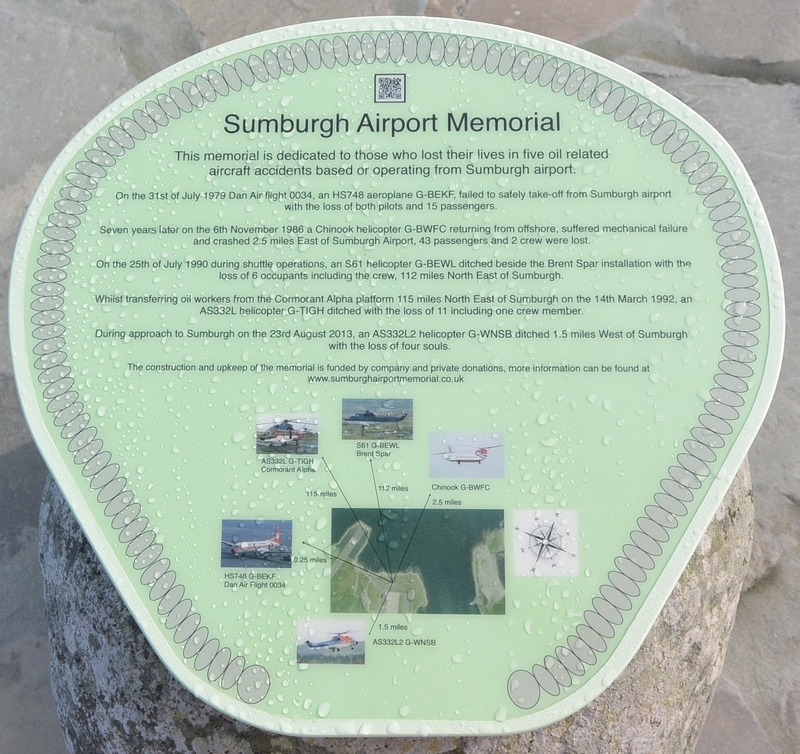 Welcome to the Sumburgh Airport Memorial site. This memorial is dedicated to those who lost their lives in five aircraft accidents, related to the offshore oil industry, all of which were based or operated from Sumburgh Airport. On the 31st of July 1979 Dan Air flight 0034 an HS748 aeroplane failed to safely take-off from Sumburgh airport with the loss of 17 lives. Seven years later on the 6th November 1986 a Chinook helicopter returning from offshore, suffered mechanical failure 2.5 miles east of Sumburgh Airport with the loss of 45 lives. Four years afterwards, on the 25th of July 1990, during a shuttle operation in the Brent oil field an S61 Helicopter ditched beside the Brent Spar installation, 112 miles north-east of Sumburgh with the loss of 6 lives. On the 14th March 1992, whilst transferring oil workers from the Cormorant Alpha platform 102 miles north-east of Sumburgh, an AS332L helicopter crashed with the loss of 11 lives and on the 23rd August 2013 an AS332L2 helicopter approaching Sumburgh airport ditched with four fatalities. A memorial committee was established in Shetland during June 2012 to erect and maintain the memorial which consists of a stone structure and two hardwood benches, the site was opened in May 2013 and an additional section was constructed during 2014 to the latest tragedy. The construction and upkeep of the memorial is funded by company and private donations. Donations can be made by clicking on the secure online Paypal Donate Button indicated left and throughout the site, using any credit or debit card, or by post, postal details for which can be found in our contacts page. Thankyou for your support.